What kind of pool person are you? In Southwest Florida there are two types of pool people, and because chances are good that you will spend a lot of time by the pool, determining which type you are can play a large role in your future happiness in Florida. There are those that see a community pool as a fun social outlet for meeting new people and spending time with friends, the kind that love to interact with neighbors over a BBQ or potluck. On the other hand, there are those who seek a private pool for quiet and seclusion and who would rather stick their nose in a good book or swim laps and do water aerobics in privacy. If you are of the latter type and would prefer not to share your pool with other residents in your community, then Southwest Florida condo living may not be for you. Do you love or abhor outdoor honey-do projects? One key reason that people choose a condo over a single family home in Southwest Florida is because they love a maintenance-free lifestyle. The condo association takes care of everything outside of your door, including the grounds, building exterior, surrounding streets and sidewalks, and any public or communal areas. Some condo buyers refer to this as “lock and go” – it’s easy to be spontaneous and head out of town for a few days or even a few months with no need to care or worry about what is happening outside the home. On the other hand, if you are the kind of person that likes to putter in the garage, plant flowers, shrubs, or trees in the garden, or work with drafting or hobby tools more suitable for a garage or private driveway, then a single family home is probably right for you, where you can hire outside services for routine maintenance but still have responsibility and control over the home’s exterior and grounds. Do you hope to make some extra income renting your home? 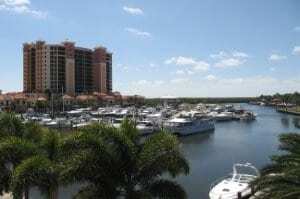 Southwest Florida tends to be a popular locale for snowbirds, people who spend their winters down South where the weather stays warm year round and their summers up North where the weather stays warm for a few select months. But if you plan to purchase a winter home in Southwest Florida, you may be wondering how best to make use of your home during the remainder of the year, and if you plan to spend some winters up North, you may have smartly realized the income potential in renting out your home in Southwest Florida for the busy season. While, when you own a single family home you can generally rent it whenever and to whomever you see fit, such is not always the case with condos. Some condos do not allow you to rent them out at all, while others have strict policies in place for how often and for how long you may rent them, so if this is an important factor, be sure to ask about the rental policies of the communities you are interested in. On the flip side, some Southwest Florida condo buyers want a community with low or no rentals allowed. Are you an animal lover or do you prefer companions that can talk back? Each condo will have its own set of rules regarding pets, but you’d be hard-pressed to find an association that doesn’t at least have a few restrictions in place, generally regarding the size and number of pets allowed, as well as the restriction of certain large or “aggressive breeds.” If furry friends are simply not for you then you may want to choose a condo community that does not allow pets at all, as these are generally more common then condos that do allow pets. But if you do prefer to share your company with a few cats or dogs, or both at the same time, then choosing a singe family home may be your best option. Are you okay with following rules or do you like to set your own? Nearly all communities, both condo and single family home, have codes of their own and some form of deed restrictions (except in rural areas), though condo communities and gated communities tend to have more rules than neighborhoods comprised of single family homes. If you don’t want to follow rules about, for example, where and what you can plant outside, what you can put on the balcony (for example, no BBQ grills), whether or not you can install a cable dish on the exterior, and whether or not you can bring your muffler-less Harley, then either you need to find a very flexible condo community or you are better off with a single family home. Does the idea of someone else having control over your community make you cringe? Every condo community is governed by a board of directors (typically made up of residents) and a property management team. Some condo owners love leaving all the pesky details to the board, and some even look forward to joining the board themselves, attending board meetings, and participating in all the details about community’s future (growth, upgrades, policies, hiring/firing staff). If the thought of your neighbor being the “Chairman” of your community gives you the weebie-jeebies, see the above paragraph regarding community rules. Do you find maintenance fees to be a convenience or a hassle? All condo communities have a Condo Homeowner’s Association and sometimes even a Master Homeowner’s Association. Some consider this a convenience – pay one fee and it takes care of exterior insurance, water/sewer, basic cable, grounds maintenance, and sometimes more. Some consider the extra fees to be excessive. If you want control over all your services and their costs, then a single family home is for you. If you are happy to have someone else worry about all that, then you’ll appreciate the hassle-free living of a condo community. (It’s worth noting that in many cases condo fees, when compared to single family home operating costs, are often very close to the same figure.) However, if the community has special amenities, such as a bundled golf course membership, then the fees will be much higher.